So last night I trekked up Cameron Pass to enjoy the peak of this annual treat of an astronomical event and got away with some keepers, even with the moon! 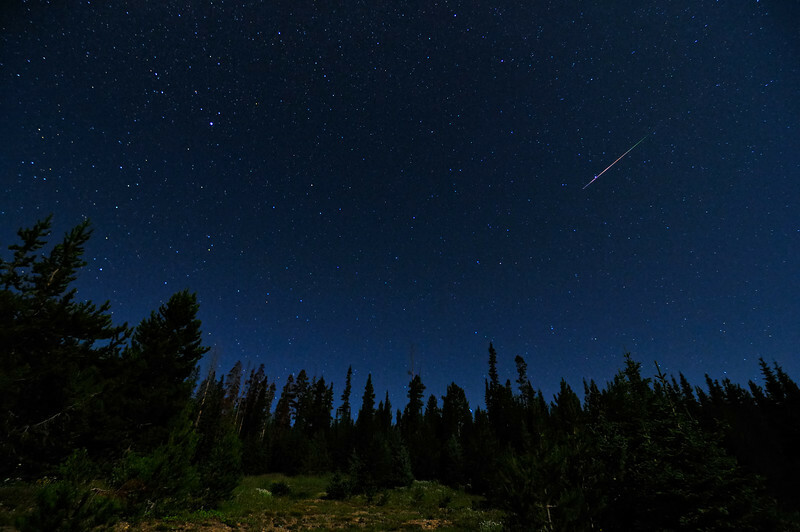 I can only imagine how bright this nice fireball meteor would have been under a moonless sky. I saw 69 Perseids total between 10 pm - 3:30 am MST. If you missed em' last night, continue to look the next several nights as they will wind down now until around Aug. 24. Shot Notes: Due to the moonlight and still wanting a night sky, I used ISO 1000 vs 1600 and went with 30 seconds at F/3.2. I also didn't directly point toward the radiant as I was trying to avoid the part of the sky incredibly lit up by the moon. I will have a stacked star trails version of this in the coming days.